"Operation Deadstick" historical map formed from 6 unmounted (heavy paper/light cardstock) 12" x 18" glossy map panels, "King Red" historical map formed from 3 map panels (as above), 6 pages King Red rules, 4 pages Operation Deadstick rules, 3 scenarios (King Red), 8 scenarios (Operation Deadstick), 736 die-cut counters. 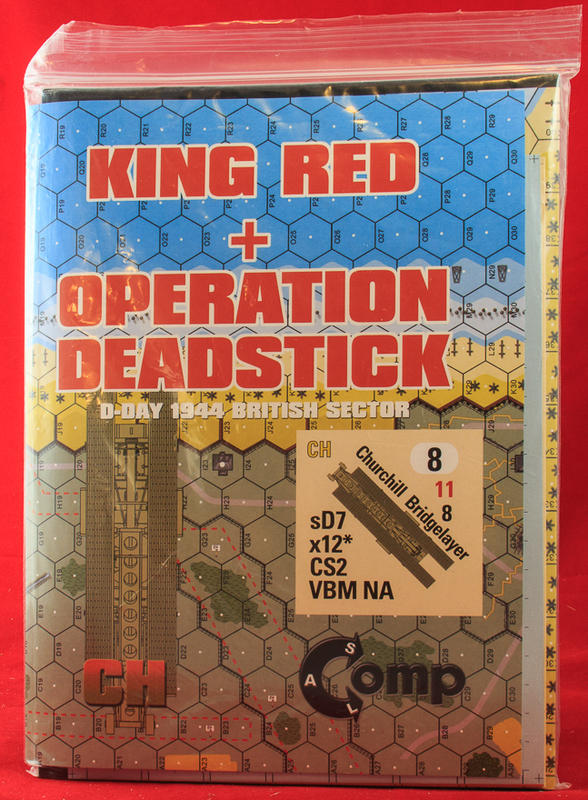 In 2017, Critical Hit released a new product, dubbed “King Red + Operation Deadstick,” a relatively rare combination of two separate historical modules, even to the point of having separate rules pages. What the two shared was a common theme of being British actions in Normandy on D-Day. “King Red,” the smaller of the two modules, portrays a section of the D-Day landings on the extreme left of Gold Beach that used some of the British “funnies” (tanks modified to serve exotic purposes such as bridge-laying and mine destruction). 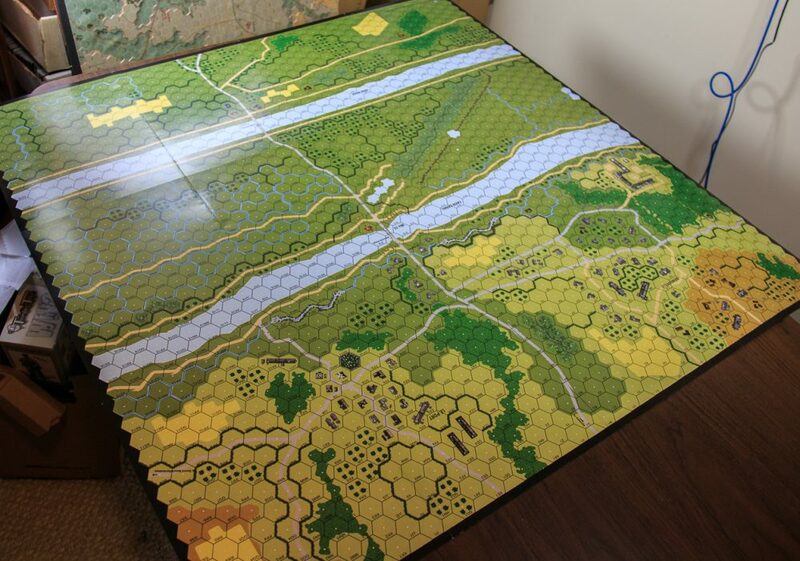 “Operation Deadstick” portrays the British glider landing to take bridges over the Orne River and the Caen Canal, i.e., the same action portrayed by the official HASL module Pegasus Bridge (probably not a coincidence). Critical Hit provides countersheets that are partially common to both modules. Because this product contains two essentially independent modules, this write-up will first describe the counters, then discuss King Red, followed by an analysis of Operation Deadstick. 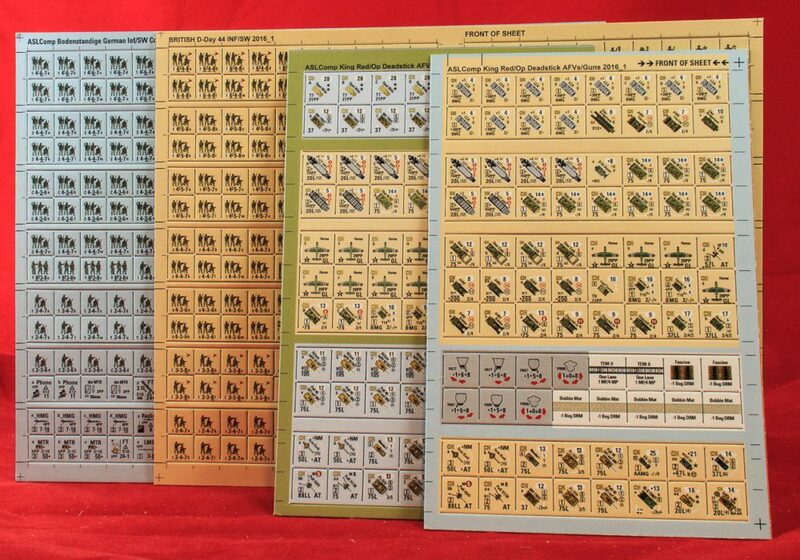 The product comes with 2 sheets of 1/2″ counters (560 counters total) and 2 half-sheets of 5/8″ counters (176 counters total). The counter totals provided on the Critical Hit website are, as is common, incorrect. As Critical Hit notes, not all of the counters provided are actually used in the product. The bulk of the remaining counters are duplicates of existing official ASL counters, primarily British and German MMC, SMC, and SW. Others are essentially only cosmetically different, such as British-colored landing craft. 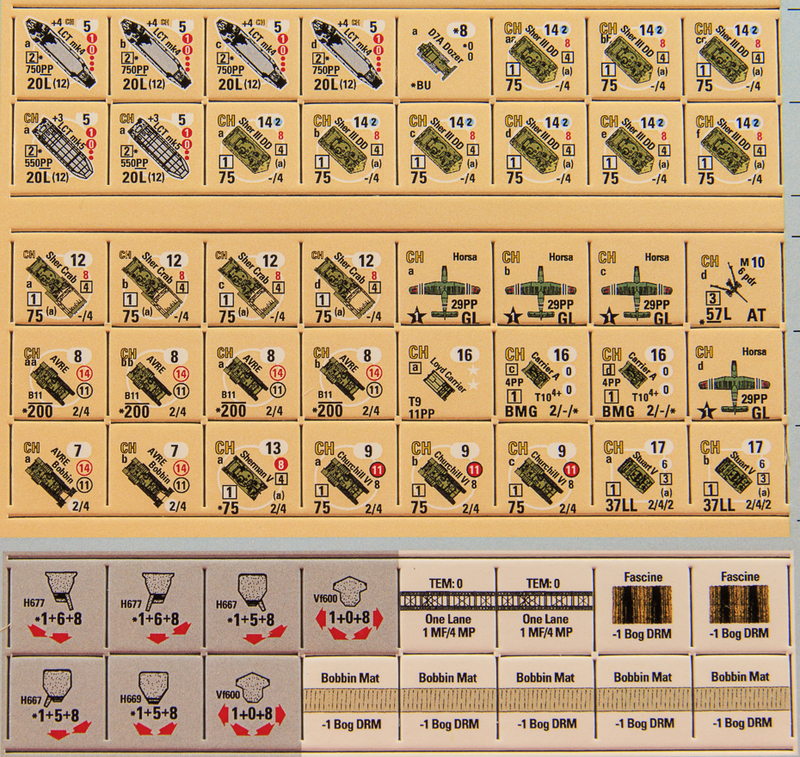 However, there are some specialized fortification counters and a few other new counters. The die-cutting of the counters is not great, particularly for the 5/8″ counters, some of which also have registration issues (this has occurred with other CH products released around the same time, at the same respective place on the countersheet, which suggests that the problem is not a one-time flub). Other than those issues, the counters are nice enough. Critical Hit says that enough counters are provided to play all the scenarios but if players “need a counter here and there,” well, real men shouldn’t whine. This admonition not to whine is common with Critical Hit. 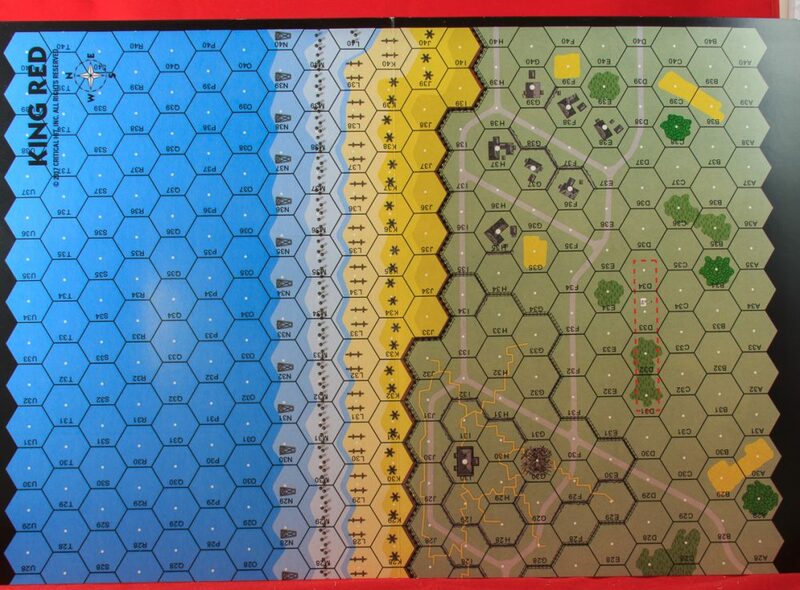 King Red is the module depicting a slice of the D-Day landing. It is not clear if it was always meant to be stand-alone or if it is a piece “broken away” from Critical Hit’s future British beach D-Day releases. It centers on its historical map, which is formed from three overlapping glossy map panels, each of which is 12″ x 18″ and printed on light cardstock/heavy paper. The map depicts a small section of ocean, beach, and hinterland. According to the rules, not all of the map area is used and the unused map area “will be used later, and linked to…upcoming Sword, Gold, and Juno Beach modules.” It is not clear if those modules will duplicate the King Red map or if this map will later be needed for those products to complete the British landing area. The map is, overall, an attractive map. It contains many printed fortifications, which ease counter clutter, and contains other user-friendly features, such as depicting fortified buildings with black outlines around them to aid identification (though the outline could be thicker). The shade of green on the map, however, is oddly different from the green used in its companion module, an example of Critical Hit’s tendency towards inconsistency. 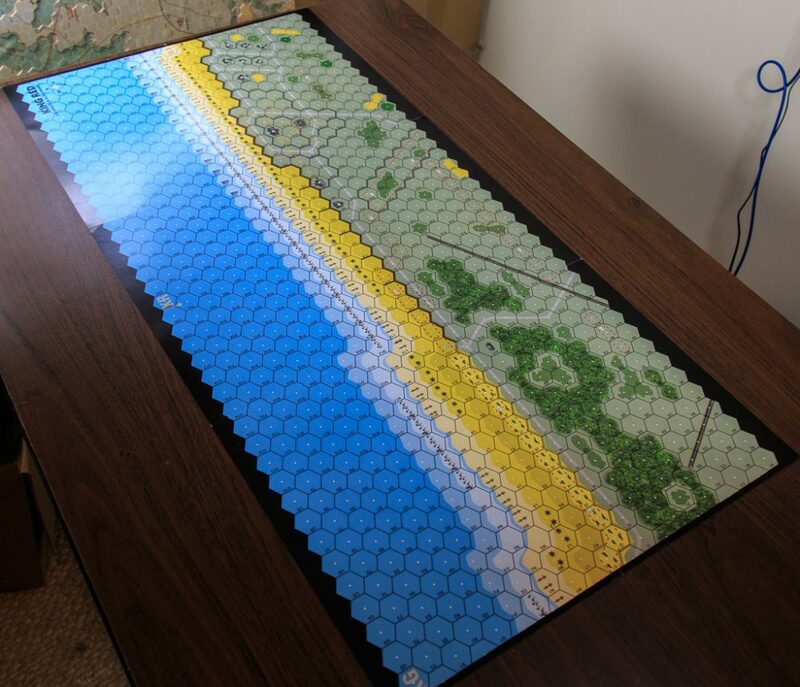 Most of the rules are dedicated to the terrain features of the map, such as outlining the printed fortifications, providing the array of beach terrain, from beach sand to beach dune, and sea walls to tetrahedrons. There are also rules for new pillbox types and casemates and weapons pits. There are also a few rules for British vehicles and other items, such as Bangalore Torpedoes and Tetryl Charges. 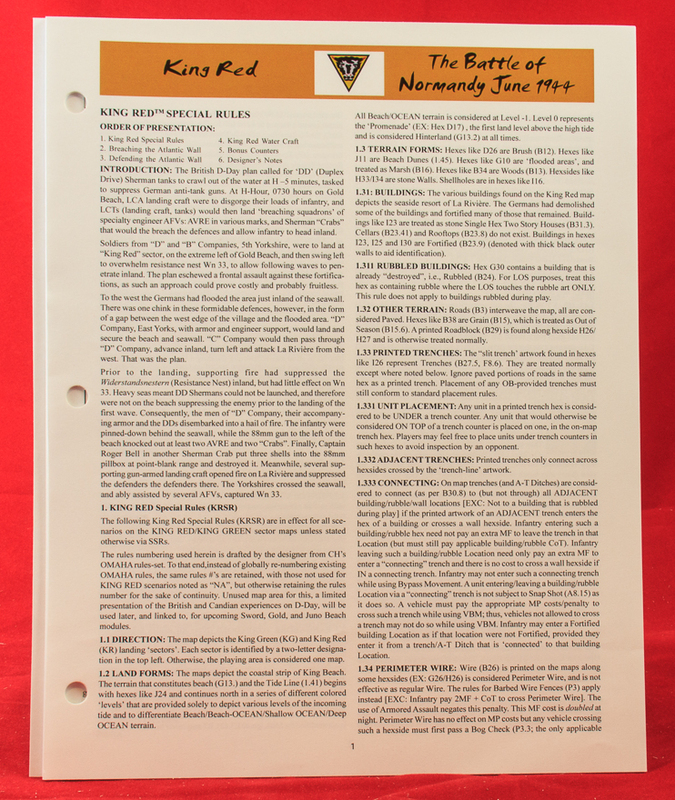 Interestingly, King Red contains designers notes, a very rare feature for Critical Hit products. The listed designer is Robert Martin. He is unknown to Desperation Morale. It is not clear if he designed King Red as an ATS game (such a product exists) and the game was then ported over to ASL, or if he actually designed it for ASL. Moreover, in a rare occurrence for Critical Hit these days, some actual people other than the designer are listed in game credits. While some of these credits are for Critical Hit’s Omaha games (from which this module was derived), Critical Hit actually lists people as being involved with “development and proofing” of the module and they are real not-made-up people. While nobody is explicitly listed as a playtester, which is not a good sign, the fact that there are people listed under “development” is far more than ASLers usually ever see with a Critical Hit product these days and suggests that perhaps this module got a little TLC than the typical rushed-out-the-door Critical Hit product. One would like to think so, in any case. A girl can dream. Unfortunately, King Red comes with only three scenarios. 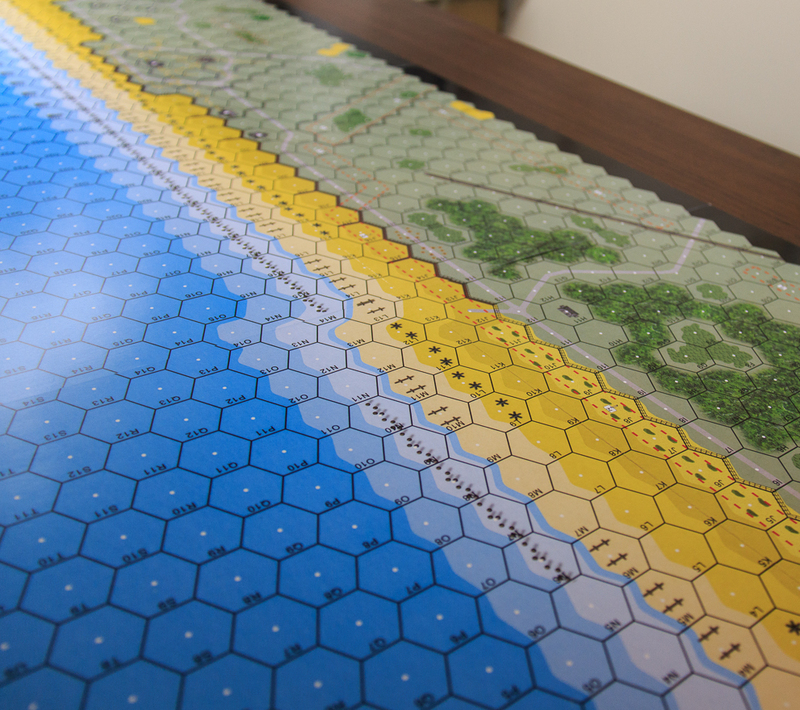 KR1 (WN 33) is a Seaborne Assault scenario featuring 15 British squads hitting the beaches, accompanied by nearly a dozen “funnies,” including Sherman Crabs, AVREs, and a bridgelayer. Someone’s Chapter H could get some exercise here. They are followed by no fewer than 9 amphibious “DD” Shermans (pray they make it to the beach). Later, 15 more squads arrive. They also get 120mm NOBA. The Germans have 13 squad-equivalents of troops (and not very good ones, though they are well-armed), but they also have 2 50mm AT gun and an 88mm AT gun in nasty pillboxes. The British have to dominate a particular German “resistance nest” to win. Needless to say, it’s a large scenario. KR2 (Posted the Letter) is even larger. The Germans get substantially the OB they had in the previous scenario, while the landing British get 30 squads and 21 AFVs (all funnies), plus a dozer and two bridgelayers for good measure. To win, the British must neutralize the German 88mm AT gun and get a bunch of squads past the beach into the hinterland. KR3 (“C” Company’s Turn) is the “baby” of the bunch and the one scenario that starts with the British already on shore. Here 15 British squads, 3 Sherman DDs and 2 AVREs (plus 120mm NOBA) take on 6 German squads, plus three crews manning MG, as well as two 50mm AT guns in fortifications. The British basically have to clear the Germans out of most of the map area. The second module in the product is “Operation Deadstick,” the glider-borne attempt to capture Pegasus Bridge. As mentioned, there is an official ASL module on this exact subject. While not one of the best HASLs, it is still pretty popular. It is also out of print. In recent years, Critical Hit has several times attempted to ape popular ASL products previously published by other companies. It did this with a Kinetic Energy product, for example, by releasing Across the Aller. More recently, it deliberately took aim at an official out-of-print ASL product, MMP’s Blood Reef Tarawa, by releasing its own Tarawa. 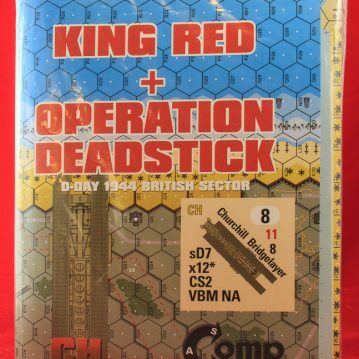 Here, Operation Deadstick seems to be taking aim at another out-of-print official ASL product, Pegasus Bridge, even going so far as to name its map Pegasus Bridge. The OD map does not seem to plagiarize the PB map; both are only rough approximations of the terrain (as can be seen by comparing the Chateau de Bénouville from both maps with its real world counterpart). The OD map covers a slightly wider area than the PB map does, largely because the latter left out the Orne River area due to a lack of fighting. Critical Hit takes some of the terrain types developed for PB, such as irrigation ditches and partial orchard hexes, and creates simplified versions of the rules for them. 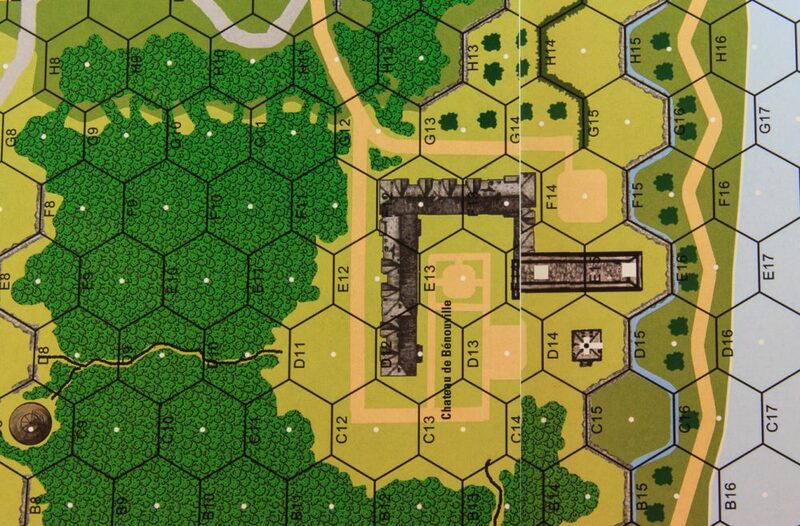 The OD map also includes some printed fortifications. The OD map, though taking up more space, includes larger hexes than the PB hexes (which were smaller than normal official HASL hexes usually are). The map includes shades of green that are, as mentioned above, different from the shade of green in King Red. Why this is the case is not clear. The OD map also contains internal inconsistencies, such as two different types of building artwork. Some stone buildings on the map are the same buildings that appear in many other Critical Hit products (simply copied and pasted, essentially), and are recognizable by the jaggy edges of the bitmap graphics when not aligned perfectly horizontally or vertically. The other buildings, of apparently more recent vintage, do not have this problem. Owners of the product can compare the style of the building in hexes EE6-FF5 to that of GG8 to see the differences. 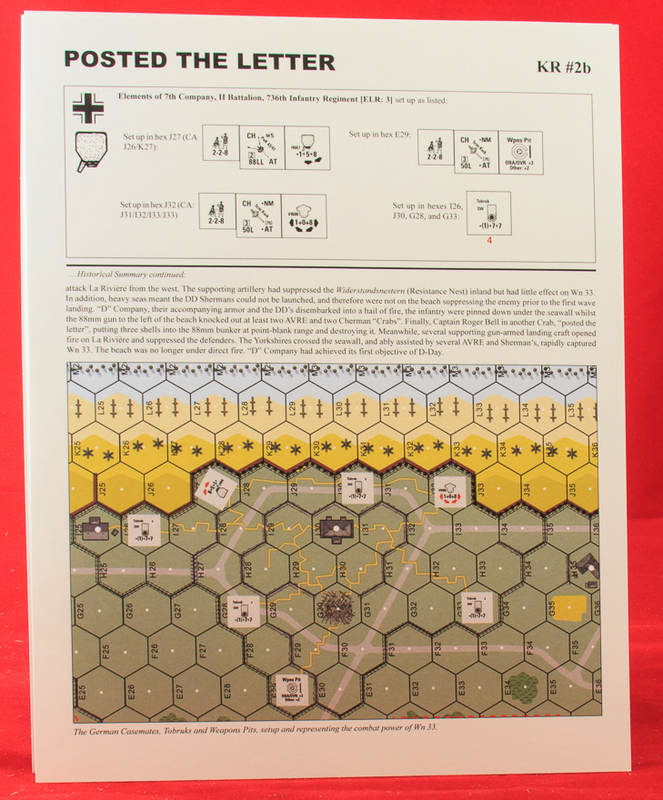 OD contains only 4 pages of rules, about half of which deal with terrain and the other half with the British or with German vehicles. No designer is named–which usually means that the designer is Ray Tapio–nor are any developers or playtesters listed, a fact about which ASLers ought to be able to draw the proper conclusions. The most notable thing about the 8 OD scenarios included is that none of them are Glider Landing scenarios. 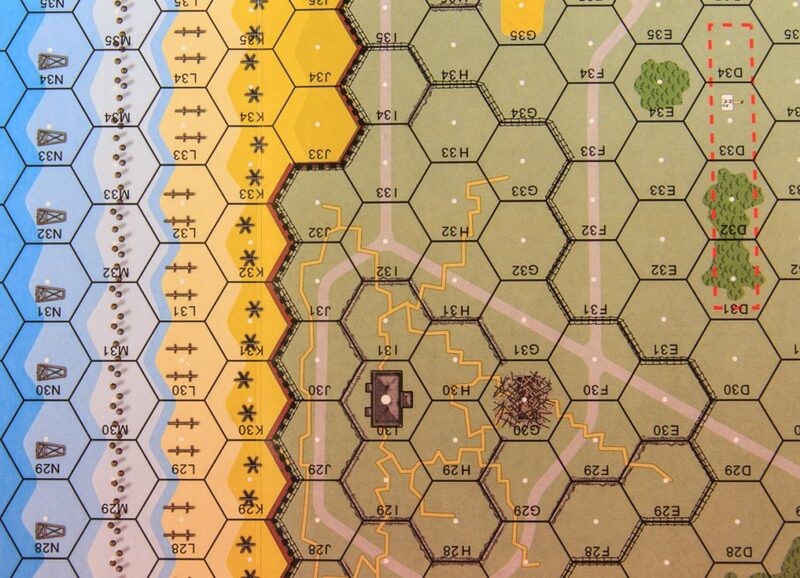 Whereas Avalon Hill’s Pegasus Bridge provides a Glider Landing scenario and begins one of its campaign games with a Glider Landing, OD simply prints gliders on the map and starts after the landings have completed. That is why this product does not have a Paradrop/Glider Landing tag on it (though there are “optional” rules that allow players to modify to OD scenarios to include landings). OD includes five small scenarios, one medium-sized scenario and two large scenarios. Three scenarios use Night rules (although CH tries to simplify them by having players ignore things such as Cloaking and No Move). No scenarios have OBA or Air Support. Six scenarios have AFVs. As can be seen, OD tends towards the small. Indeed, some of the scenarios are tiny. OD2 (Landing Zone “Y”), for example, is a 3.5 turn scenario that features 3.5 British squads and 1.5 German squads. It is not really clear why anybody would bother to play something so small. 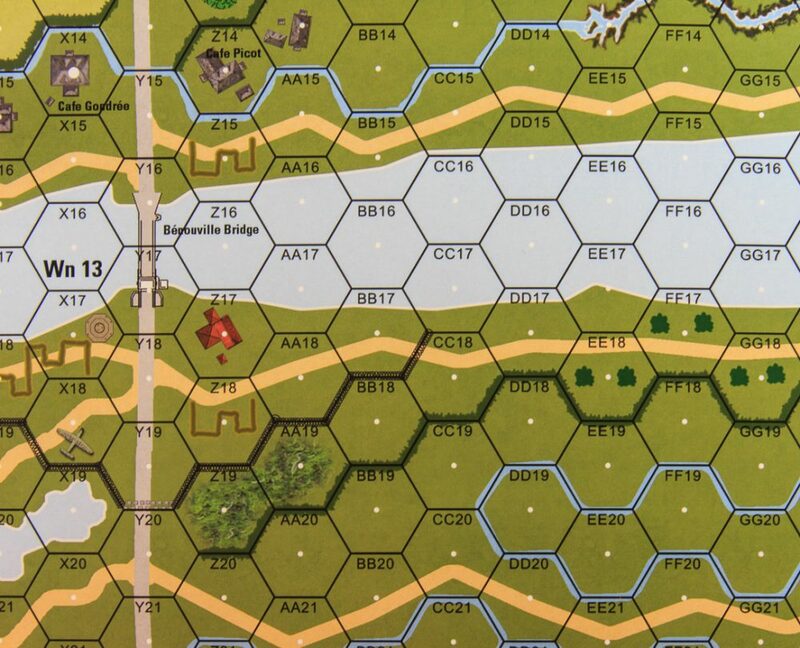 Scenario OD1 (Landing Zone “X”) apes Pegasus Bridge scenario PB1 (Ham and Bloody Jam) quite closely, even down to having an SSR limiting German fire attacks on Turn 1 (in Pegasus Bridge, they may only make TPBF attacks; in Operation Deadstick, they may only make PBF attacks). Scenario OD3 (Howard’s Bridgehead) clearly mimics Pegasus Bridge scenario PB2 (Howard’s Men), even down to the division of the British force up into six discrete groups set up in six discrete locations. Scenario OD4 is similarly closely derivative of PB3 (Piecemeal). It should come as no surprise that OD5 (On the West Bank) is a counterfeit of PB4 (Killean’s Red). Are you sensing a pattern here? It is a pattern that OD6 (Are They Panzers?) vindicates, so similar it is to PB5 (Taylor Made Defense). However, OD7 (Piper’s Arrival), though featuring the exact action as PB6 (It’s About Time), contains numerous differences of significance. The final OD scenario, OD8 (March of the Warwicks) is simply a monster scenario that serves as a substitute for the campaign games of Pegasus Bridge. Lest anybody be mistaken, this strong a correlation between the actions chosen to be simulated, as well as the OB and other choices made for the respective sets of scenarios, is highly unlikely to be a coincidence. 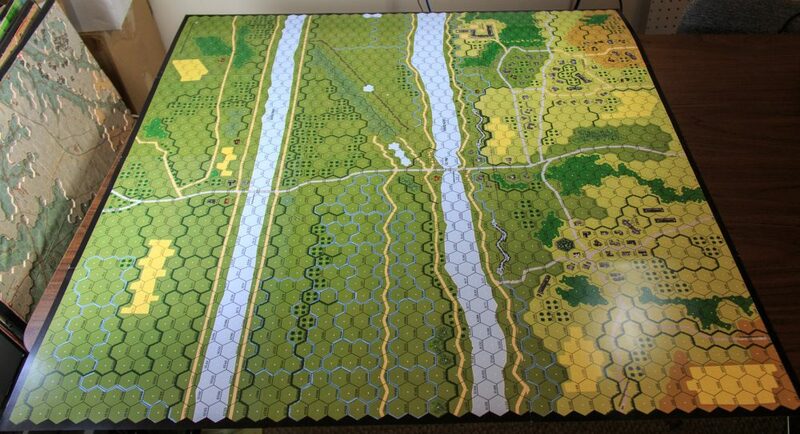 Operation Deadstick appears to be Critical Hit’s attempt to mime Avalon Hill’s Pegasus Bridge with a different map and a few minor changes. Why Critical Hit would choose to do this is an excellent question. It should be noted that the OD rules provide a few paragraphs laying out an “Optional” linked-scenario campaign, which theoretically allows players to string some of the scenarios together. These rules contain a confusing reference: “If equipped to play the Bonus scenarios, play Scenario #8…” There do not appear to be any other references to “bonus scenarios” in the product, so it is not at all clear what this means.